This past week we got some positive news out of Canada: an amazingly strong employment report. CTV News: - Canada's economy created an impressive 95,000 new jobs in May -- the biggest monthly gain in nearly 11 years -- blowing away the expectations of most analysts. Economists had expected anywhere from 10,000 to 15,000 new jobs last month. Instead, the economy created several times more, sending the unemployment rate down one-tenth of a point to 7.1 per cent. Even Prime Minister Stephen Harper seemed a little surprised by the numbers, cautioning that the Statistics Canada monthly reports are subject to wide margins of error. "We don't obviously want to pay too much attention to what happens month to month, because we know this is very volatile, but the Canadian economy is now up to about a million net new jobs created since the recession," he said at a photo event in Ottawa. This is certainly great news for Canada, a nation that has been facing significant economic headwinds (see discussion). The unemployment rate has fallen to 7.1%, while youth unemployment fell to 13.6% from 14.5%. A look behind the headline numbers reveals a somewhat troubling trend however. As the Bank of Montreal (BMO) latest research points out, construction seems to be a major driver of job creation. Almost half the jobs in May came from construction, while the manufacturing sector lost jobs. It is great to see construction creating jobs in Canada - particularly for young people - but as BMO points out, it's a mixed blessing. Construction now accounts for a record high percentage of overall employment, putting Canada at risk. BMO: - This is a mixed blessing to say the least, since there was already plenty of concern that the Canadian job market had been artificially pumped up in recent years by the building boom—well, double down on those concerns, as construction payrolls now account for a record high of overall jobs at 7.6%. Bank of Canada is of course keenly aware of the situation and remains quite concerned. In his latest speech, the Deputy Governor Timothy Lane pointed out that Canada's impressive post-recession economic stability has been driven by strong domestic demand. 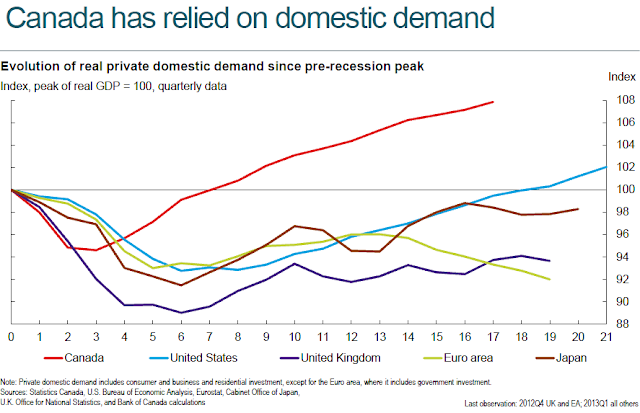 He pointed out that "there are limits to this growth strategy, as imbalances have appeared in housing markets and the financial system more broadly". A great deal of the domestic demand growth has been financed with consumer debt - which continues to grow. At the same time, while wages have gone up, disposable household incomes have been fairly stagnant over the past 3 years. That is causing household leverage to hit new highs. Canadians are now more indebted than the Brits or the Americans - two other groups historically addicted to debt. Much of that debt has been housing related. In spite of Bank of Canada's latest efforts to tighten credit in the housing market (see discussion), home prices continue to rise. Given the economic weakness, home price appreciation has been slower in recent years, but prices nevertheless are hitting new records. With demand for crude imports in the US weakening (due to increased domestic production) and the Canadian dollar remaining relatively strong, it is difficult to see how Canadian households will significantly increase disposable income in the near future. Any deleveraging could therefore prove to be quite painful. The concentrated bet on real estate and construction, while creating jobs in the short term, is putting Canadian economy at greater risk in the future.